Grinding on the posterior teeth starts as the chewing surfaces are exposed so that the activator margin contacts the posterior teeth only at the widest extent. The guidance surfaces should be ground steeply so that no acrylic gets in the way of a vertical movement of the posterior teeth if a deep bite is to be eliminated. Free grinding of the contact surfaces on the maxillary teeth is done for distal movement so that only one mesiolingual contact remains. This free grinding of the guidance surfaces is not absolutely necessary, because the distal movement of the maxillary incisors will be enforced by the thrust from the activator, just as the mandibular incisors will be pushed mesially (Fig 10-73). It is debatable whether a preferred movement occurs if the guidance surfaces are freely ground separately for the maxillary and mandibular teeth. Free grinding of the maxillary incisors for a possible retrusive movement is done by removing the acrylic palatally behind the incisors. The cervical margin and the alveolar process also must be uncovered in this area. Only the interocclusal splint for the mandibular anterior teeth is retained as a block. In the process, the interdental spaces and the cervical areas must also be exposed to prevent inflammation and too tight a fit. Try-in and adjustment of the ground appliance is performed intraorally. The patient becomes familiar with the appliance, how to insert the appliance, and how to store it outside the mouth. It is also important to explain the mechanism of action of the appliance to the patient and to emphasize the regular wearing times and checkups. The activator is generally worn at night; only at the start of the treatment should it be worn during the day for 2 or 3 hours (after lunch) so that the remodeling processes are maintained and not interrupted for long periods. Patients may also be instructed to do 5-minute pressing exercises twice a day. The mechanism of action of the activator is mechanical, although no spring components or screws are used for support. The ground inclined guidance surfaces produce the intermittent loading and hence the areas of compression and tension in the periodontium. The forces for this exertion of pressure arise due to mandibular movements when swallowing and breathing (mandibular movement synchronous with respiratory rate), tongue activity, and general head movements when sleeping. The mandible is always forced into an eccentric position differing from the resting position, which means that forces are applied to the teeth via the activator and from there into the area of tissue remodeling. Excessive stresses are usually unlikely to occur because of the reflex coupling. Masticatory muscle activity is altered by the activator as it initiates reflex biting movements. Unlike in deliberate biting, individual groups of teeth are only ever loaded by pressing exercises. In this respect, the activator differs from other appliances because it utilizes functional bodily forces and only to a small extent through deliberate biting. Although the forces are no different because the effect is the same in terms of tissue remodeling, this fact does relate to the property of the activator as a function stimulator. As well as reflex masticatory muscle activity, the functional interaction between lip and cheek muscles with the tongue musculature is gradually altered as well. The change in the position of the mandible relative to the maxilla and the altered tooth positions naturally have an impact on the musculature and its movement sequences. 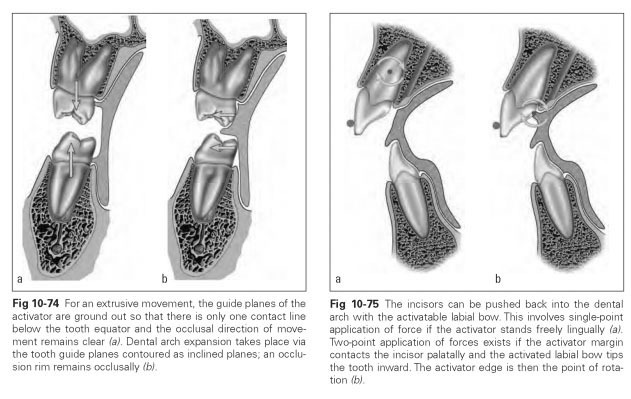 Figures 10-74 and 10-75 illustrate the action of activators in the posterior and anterior teeth, respectively.